Across the country, independent business groups that have been urging people to "buy local" are now making "bank local" an increasingly prominent part of their message, bringing new grassroots visibility and organizational infrastructure to the Move Your Money movement. "The message that big banks don't have our interest at heart and small, local banks do is really resonating," said Joe Grafton, executive director of Somerville Local First, a two-year-old coalition of independent businesses in Somerville, Massachusetts. This year, Somerville Local First devoted the back cover of its widely-distributed local business guide to a message that urges people to move their money and makes the case that switching to a local bank or credit union is an important way to support hometown businesses and your local economy. This message will also be featured in posters that the group's member businesses (there are more than 150 of them) will hang in their storefronts in the coming weeks, as well as postcards scattered at cash registers and other spots around town. At Somerville Local First's annual street festival in June, local bankers will be on hand to answer questions and help people open new accounts. Somerville Local First is one of about 130 local business alliances that have sprung up over the last few years to counter the power of big corporations and urge people to choose locally made products and independent businesses more often. All together, these groups count more than 30,000 businesses as members, from farmers and retailers to builders and bankers, and there's growing evidence that their efforts are having a measurable impact on people's buying habits. Although many of these groups have long encouraged people to ditch big banks in favor of community-rooted financial institutions, that message took on new urgency after the financial collapse. 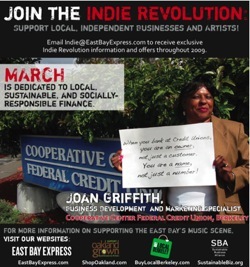 Last year, a coalition of indie business groups in the Bay Area, including Oakland Grown, Buy Local Berkeley, and the Sustainable Business Alliance, partnered with the East Bay Express on a series of advertisements that highlighted the benefits of banking with a local credit union or bank, and produced a guide to making community-conscious financial choices. Another early initiative came from the Sustainable Business Network of Portland (SBNP), which launched a Local Banking Campaign last May. A preliminary flyer helped people evaluate banks and credit unions based on several factors, including whether an institution is locally owned and whether its loans serve the community. Now, a broader coalition, including labor and civic groups, have joined with SBNP to refine the ranking system and expand the visibility and reach of the campaign. "We are preparing a new wave of local bank campaigning here in Portland, as well as in our rural communities around the state," explained one of the initiative's leaders, Jared Gardner, who left his job in the financial industry two years ago and became a community organizer. Yet another local business alliance that's urging people to ditch the big banks is Sonoma County Go Local in the Santa Rosa region of California. "Bank Local is one of our big campaigns this year," explained Derek Huntington, the group's president. 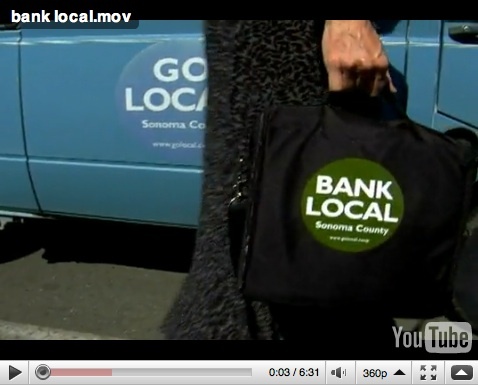 A few weeks ago, Go Local released a 6-minute bank-local video. Produced by a local television station, the video includes interviews with three local business owners, an arts organization and a hospital, all of whom describe how essential local banks have been in providing financing. Go Local is now creating a section on its web site where people will be able to find information on all of the banks and credit unions operating in the region, including a measure of how local each institution is based on what portion of their total deposits comes from Sonoma County residents. Go Local is promoting the campaign through billboards and flyers distributed at local businesses. These initiatives are not only reaching the public, but also beginning to catalyze a shift in the banking habits of independent business owners themselves. Although independent businesses are more likely than the population at large to bank at a community bank (after all, they depend heavily on these local banks for loans), both Somerville Local First and Sonoma County Go Local estimate that roughly half of their business members have their primary checking account at a big bank. "We have already started tracking and talking with our members about their banking relationships," said Joe Grafton of Somerville Local First. "For a small business, it can be a really challenging [to switch] because of cash flow. We want to learn what the barriers are and then go back to our financial partners to see what we can do to solve those challenges." "Our banks are putting together switch kits for local businesses to make that transition easier," said Huntington of Sonoma County Go Local, which is holding meetings with its business members to encourage them to move their accounts. Interest among local business groups in Move Your Money is so strong that the American Independent Business Alliance organized a panel (on which I participated) about developing local banking campaigns at its conference last week. Another national organization that many of these local business groups are affiliated with, the Business Alliance for Local Living Economies, is planning several sessions on local banking and investing at its conference next month. Starting a Move Your Money campaign in your community? See our Local Banking Campaign Kit for a some useful tips, flyers, visuals, and more.